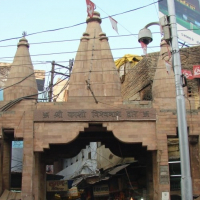 Kashi Vishwanath Temple is one of the most famous Hindu temples dedicated to Lord Shiva. It is located in Varanasi, Uttar Pradesh, India. The temple stands on the western bank of the holy river Ganga and is one of the twelve Jyotirlingas, the holiest of Shiva temples. The main deity is known by the name Vishvanatha or Vishveshvara meaning Ruler of The Universe. Varanasi city is also called Kashi, and hence the temple is popularly called Kashi Vishvanath Temple. The temple has been referred to in Hindu scriptures for a very long time as a central part of worship in the Shaiva philosophy.